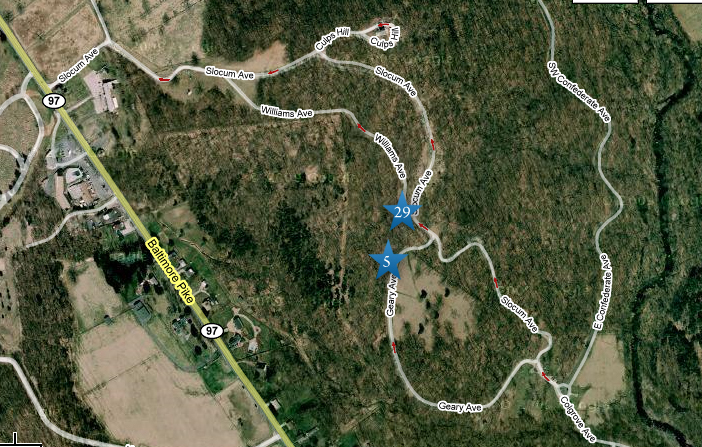 There are two monuments to the 29th Pennsylvania Infantry Regiment on Culp’s Hill. This monument was erected in 1885. 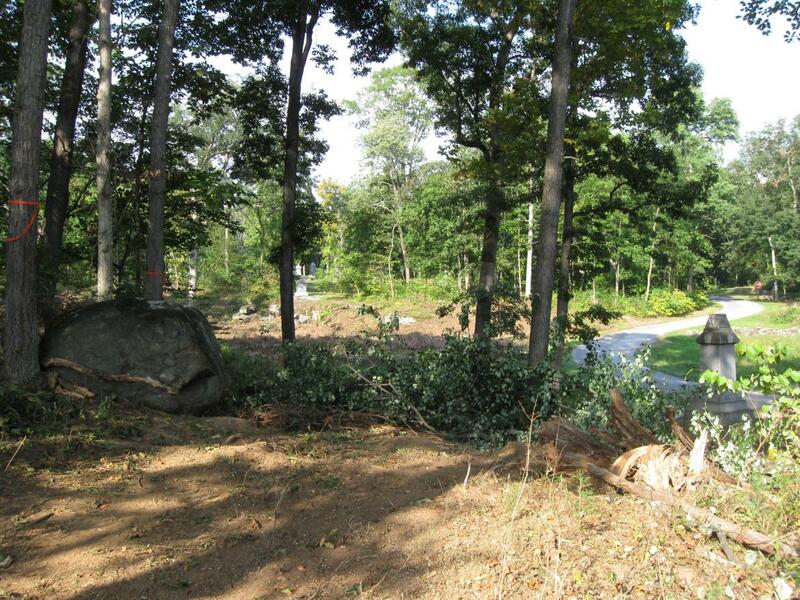 Until recently, the ravine in the background was heavily wooded. This view was taken facing northwest at approximately 4:30 PM on Wednesday, September 23, 2009. 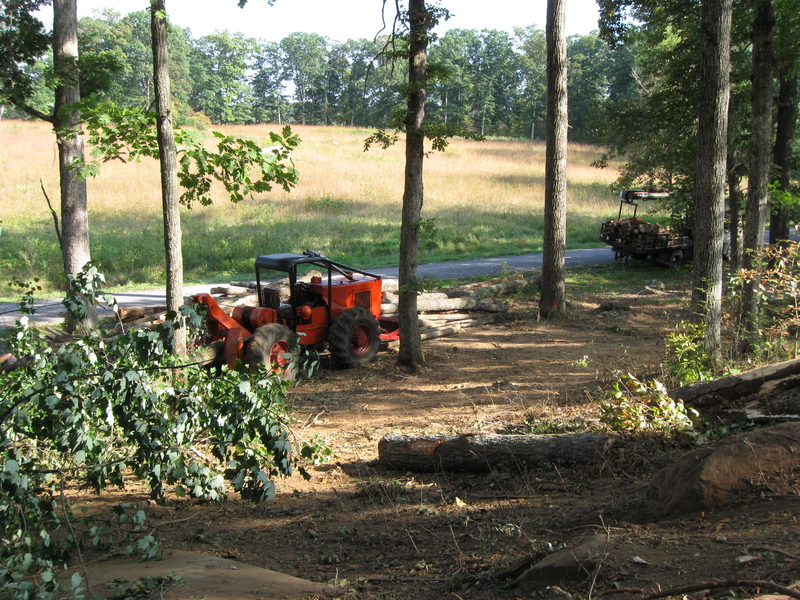 The tree cutting continues in the area of Culp’s Hill (but not yet at Spangler’s Spring). 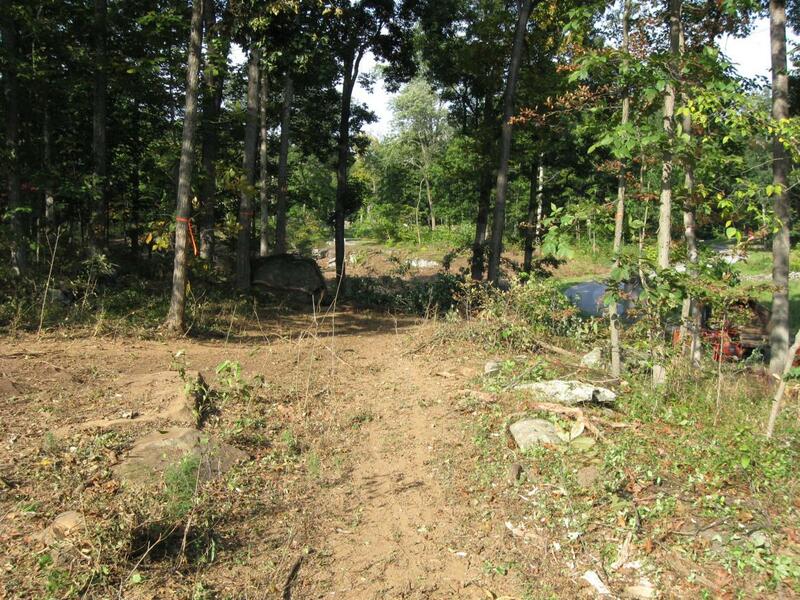 Today we take a walk around the clearing in the area of Spangler’s Lane. 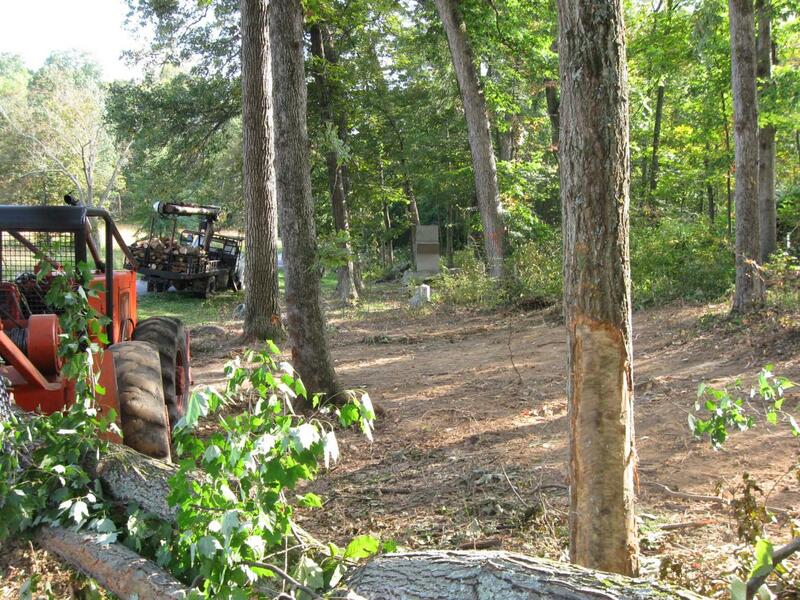 The tree cutting is near the intersection of Williams Avenue, Geary Avenue and Slocum Avenue. 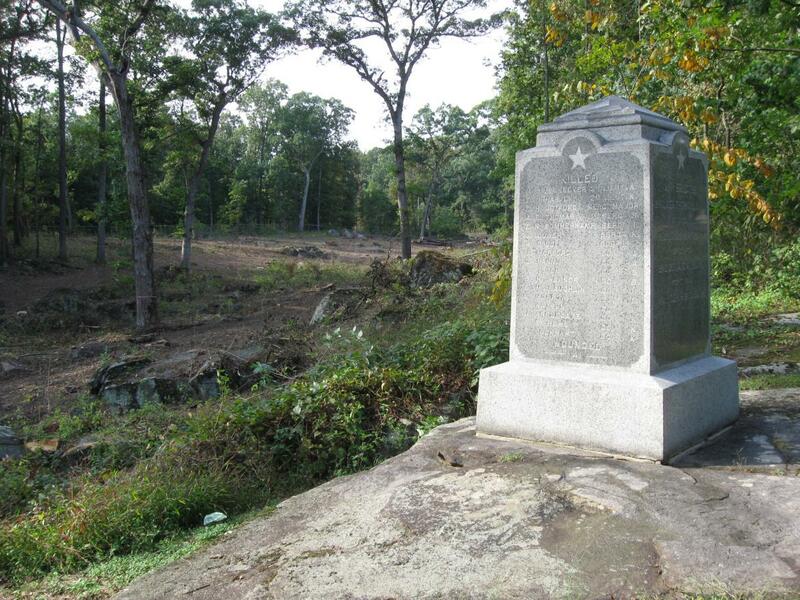 The blue star with the “5” marks the monument of the 5th Ohio Infantry Regiment. The blue star with the “29” marks the 1885 monument for the 29th Pennsylvania Infantry Regiment. This view was taken facing northwest at approximately 4:30 PM on Wednesday, September 23, 2009. 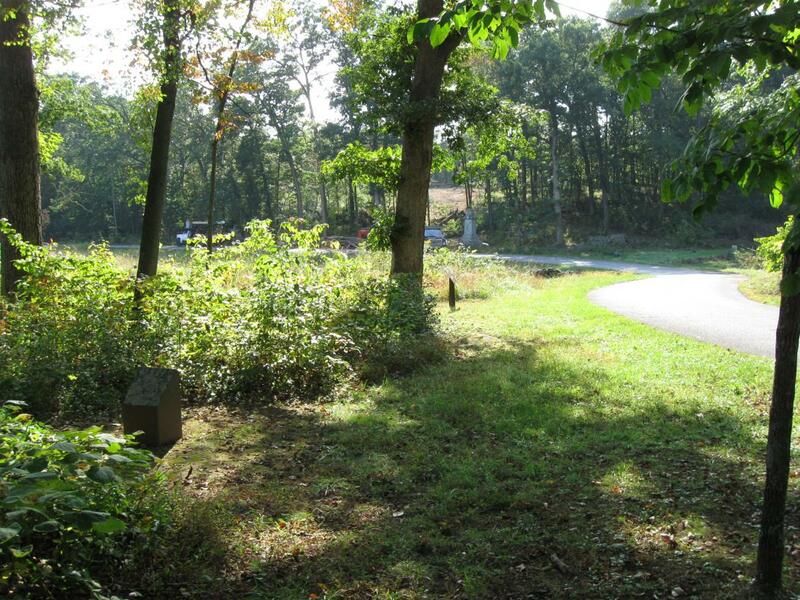 In the foreground is the advance marker for the 1st Maryland Infantry Regiment (CSA). In the left background is the star shaped monument to the 147th Pennsylvania Infantry Regiment. In the center background is the monument to the 5th Ohio Infantry Regiment. In the right background is the left flank marker for the 5th Ohio Infantry Regiment. 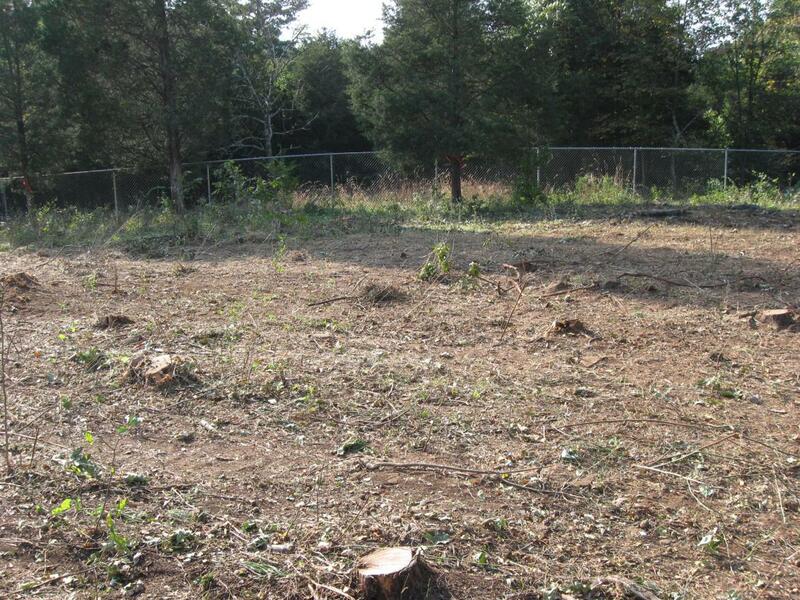 The area in the background is now being cleared. This view was taken facing southwest at approximately 9:45 AM on Sunday, May 17, 2009. Here’s an up to date view of the same area. The advance marker for the 1st Maryland is on the left. 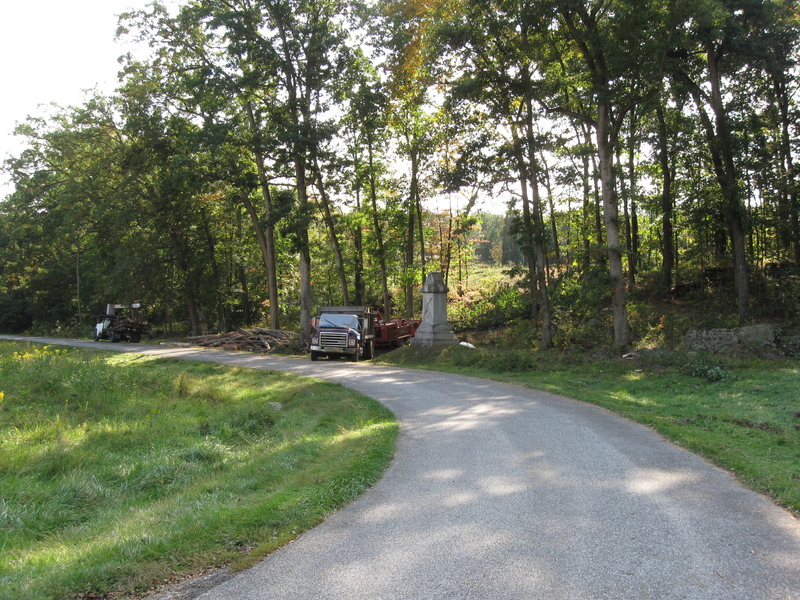 The 147th Pennsylvania Monument is behind a truck in the left background. The monument to the 5th Ohio Infantry Regiment is in the center background. 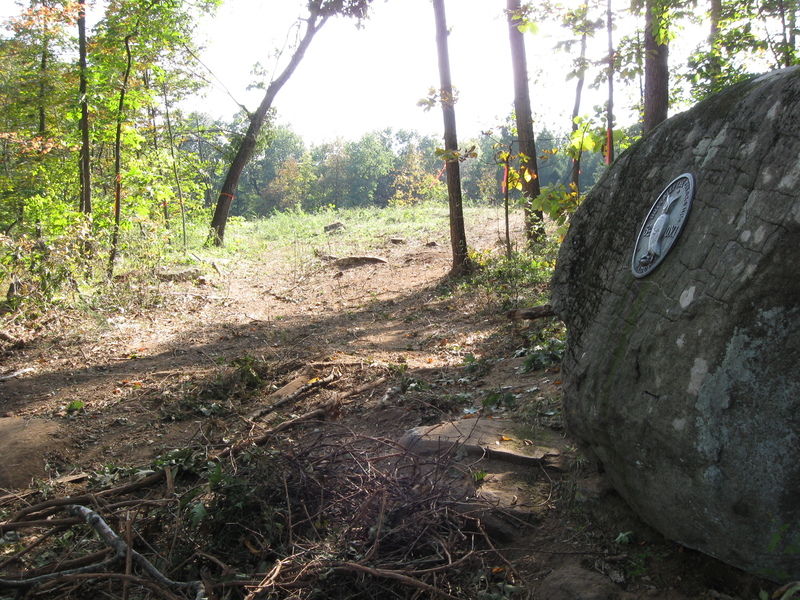 The left flank marker for the 5th Ohio Infantry is in the right background. Geary Avenue is the road in this view. This view was taken facing southwest at approximately 4:30 PM on Wednesday, September 23, 2009. We’ll first start walking towards the monument to the 5th Ohio. This view was taken facing southwest at approximately 4:30 PM on Wednesday, September 23, 2009. 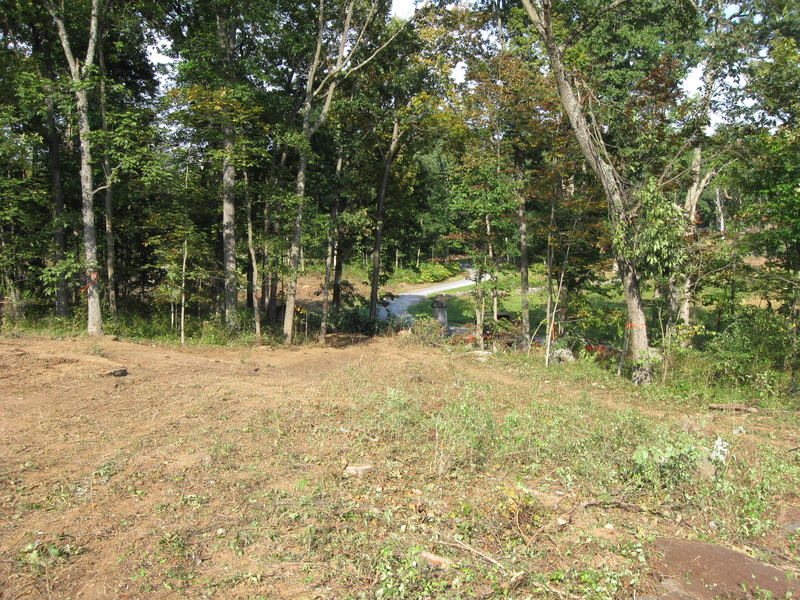 From the same location as the previous view, we’re now looking up the newly cut ravine. The 1885 monument to the 29th Pennsylvania is in the right background. This view was taken facing northwest at approximately 4:30 PM on Wednesday, September 23, 2009. We’ve stepped into Pardee Field to show a little wider view of the ravine. 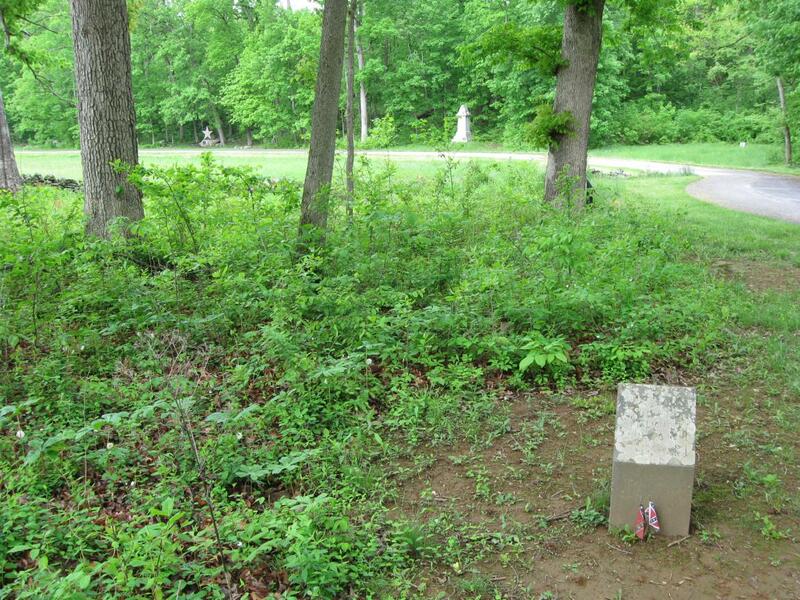 The left flank marker to the 5th Ohio is in the left background. 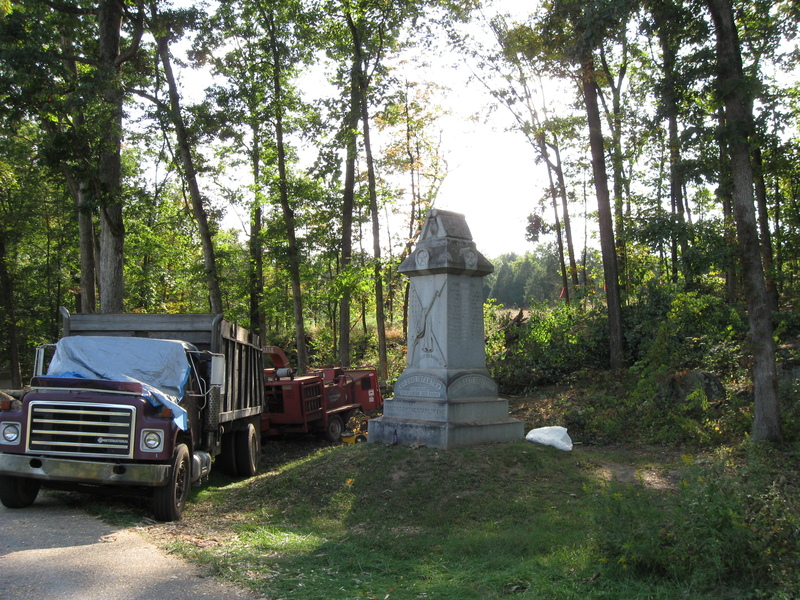 The 1885 monument to the 29th Pennsylvania is in the left background. This view was taken facing northwest at approximately 4:30 PM on Wednesday, September 23, 2009. Here’s the area around the 5th Ohio Monument this month…This view was taken facing southwest at approximately 4:30 PM on Wednesday, September 23, 2009. …and here’s a similar view in May. This view was taken facing southwest at approximately 9:45 AM on Sunday, May 17, 2009. The monument to the 5th Ohio Infantry Regiment is on the right. The 1885 monument to the 29th Pennsylvania is in the center background. 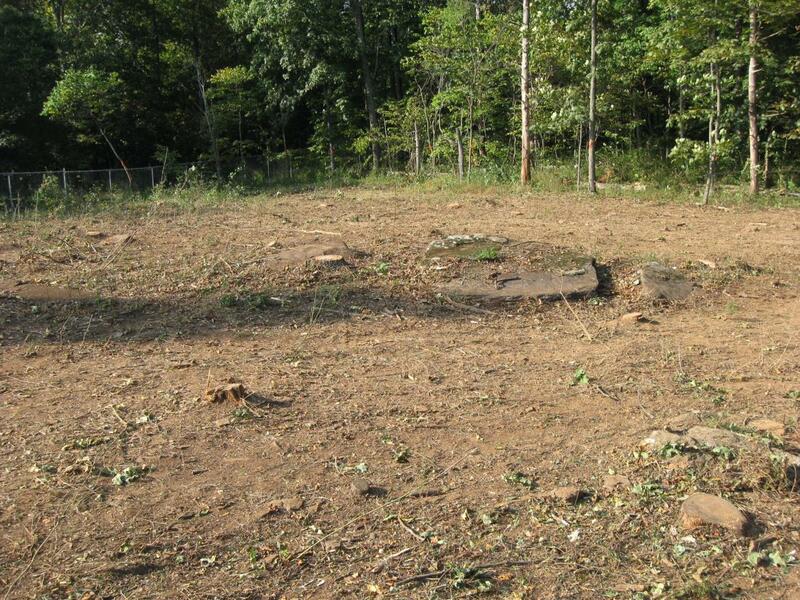 The left flank marker to the 5th Ohio is on the left. 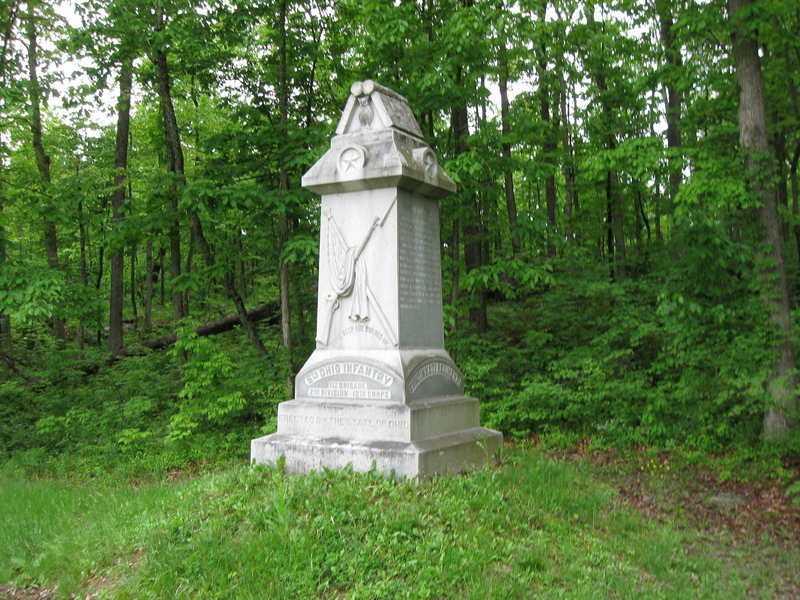 Spangler’s Lane is/was to the left of the 5th Ohio Monument. 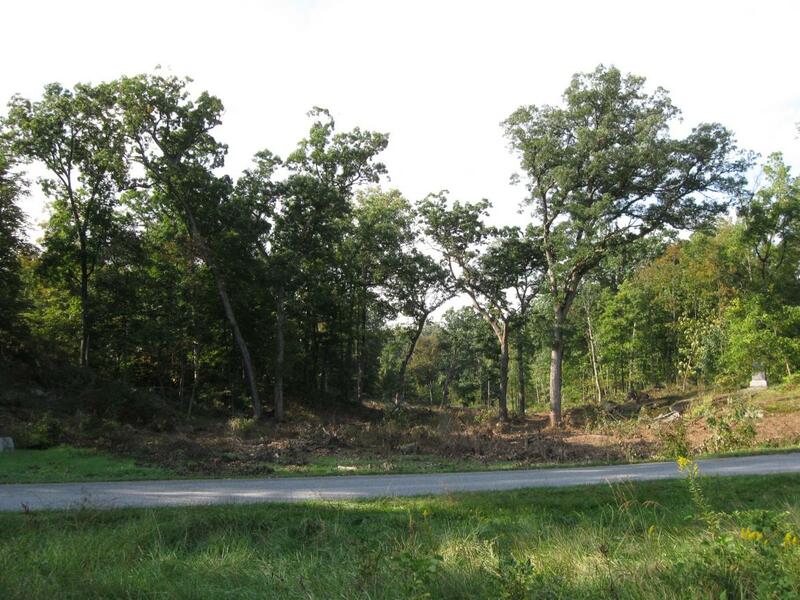 This view was taken facing northeast at approximately 4:30 PM on Wednesday, September 23, 2009. The photograph was taken from the same location as the previous photograph. 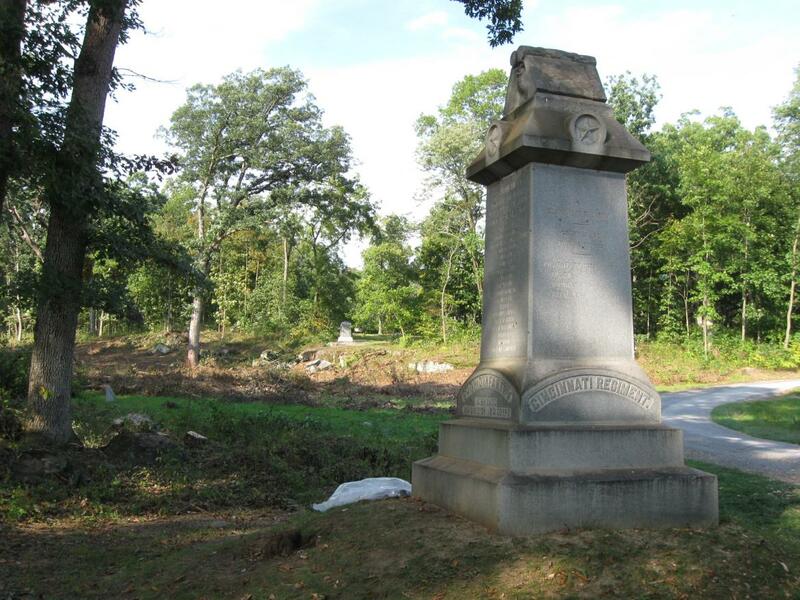 The monument to the 147th Pennsylvania Infantry is in the center background. This view was taken facing south at approximately 4:30 PM on Wednesday, September 23, 2009. We’ll walk up Spangler’s Lane. A tree is temporarily covering the road. This view was taken facing southwest at approximately 4:30 PM on Wednesday, September 23, 2009. Ok, we have to pause and get the new view of Pardee Field from Spangler’s Lane. 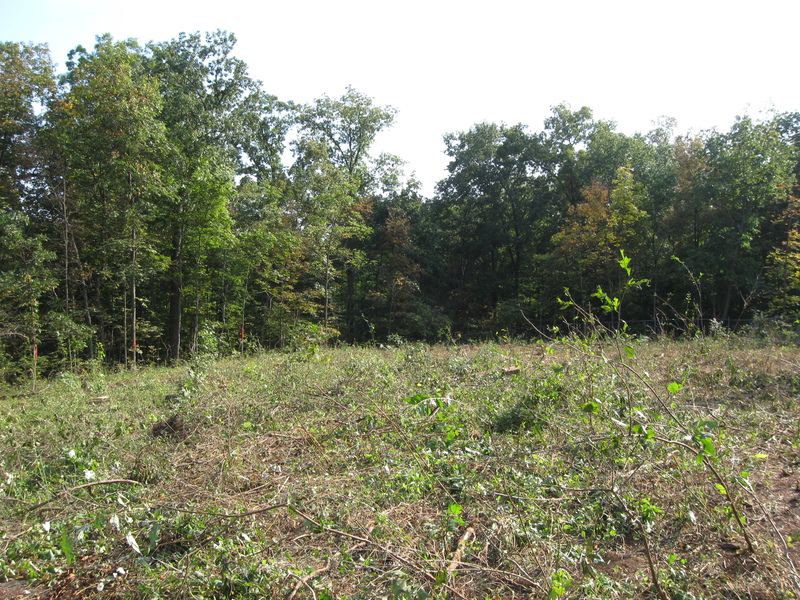 This view was taken facing southeast at approximately 4:30 PM on Wednesday, September 23, 2009. 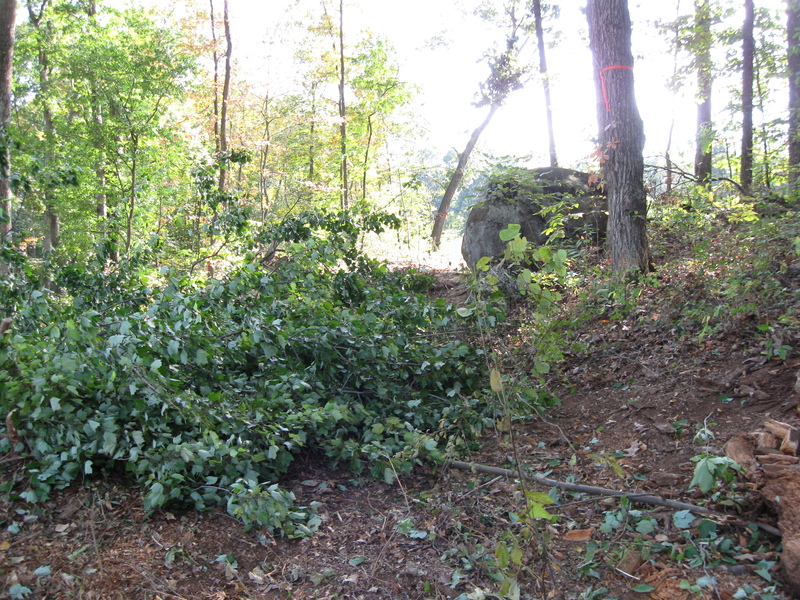 Spangler’s Lane is just to the left of the “Owl Boulder” of the 5th Ohio. This view was taken facing east at approximately 4:30 PM on Wednesday, September 23, 2009. 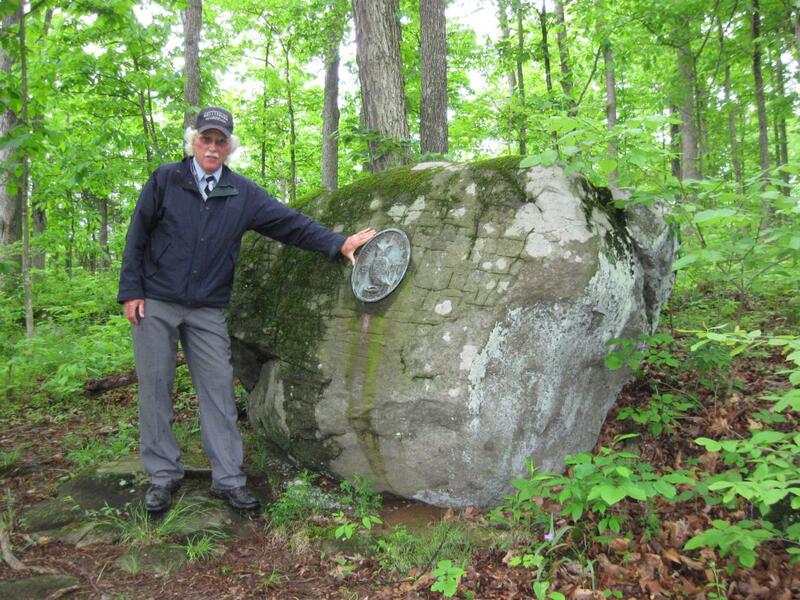 You might remember this rock from one of Gettysburg Licensed Battlefield Guide Charlie Fennell’s Culp’s Hill posts. Look at the foliage in the background. This view was taken facing southwest at approximately 9:45 AM on Sunday, May 17, 2009. We’ve moved farther to the southwest on Spangler’s Lane. The “Owl Boulder” is on the left. The monument to the 5th Ohio is on the right. This view was taken facing northeast at approximately 4:30 PM on Wednesday, September 23, 2009. We’ve moved farther up the ridge. Spangler’s Lane is now on the right. This view was taken facing northeast at approximately 4:30 PM on Wednesday, September 23, 2009. 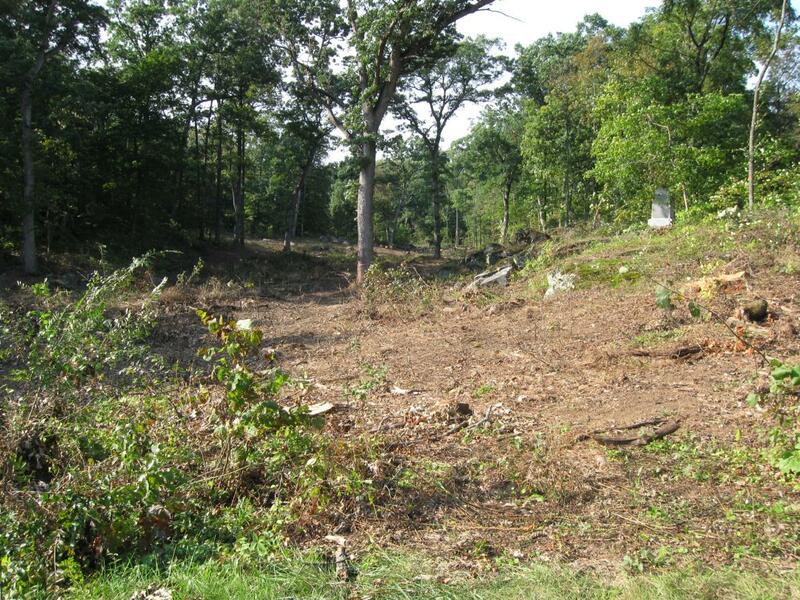 A significant area has been cleared on top of the ridge. Private property is on the other side of the fence. This view was taken facing west at approximately 4:30 PM on Wednesday, September 23, 2009. From the same location on top of the ridge looking north. This view was taken facing north at approximately 4:30 PM on Wednesday, September 23, 2009. From the same location on top of the ridge looking south. This view was taken facing south at approximately 4:30 PM on Wednesday, September 23, 2009. Next time we’ll head back towards the ravine. This view was taken facing northeast at approximately 4:30 PM on Wednesday, September 23, 2009.